A nose-on view of Messerschmitt’s never-completed P.1101, which had so much influence on aircraft design worldwide. When American tanks rolled into Oberammergau in Bavaria on April 29, 1945, the war had not yet ended and the American soldiers on the scene were partly distracted by the prospect of more combat to come. The GIs had no idea that they’d found a top secret air test facility that was unknown to Allied intelligence and had never been bombed. The troops seized a tall figure who called himself Professor Willy Messerschmitt, even though he held no academic degrees. The soldiers paid little attention to the skeletal metal frame of an aircraft that was 80 percent completed but had never taken to the air. It was the Messerschmitt P.1101, possibly the most advanced piece of German hardware ever to fall into Allied hands. After technical experts arrived, the Americans realized they’d seized the Third Reich’s best-known aircraft designer and an extraordinary airplane that was far more advanced than anything the Allies possessed. By the time they began hunting documents about the P.1101, French agents had already retrieved huge amounts of microfilm in watertight containers from a nearby cave and had spirited them off to Paris. In the period that followed, French authorities refused to turn the P.1101 microfilm over to American experts. The P.1101 was a single-seat, swept-wing jet fighter powered by a 1,962-pound thrust Junkers Jumo 004B turbojet engine intended to offer the same endurance and range as Messerschmitt’s better-known Me 262. An operational version would have been armed with four Mk-108 30 mm cannon. 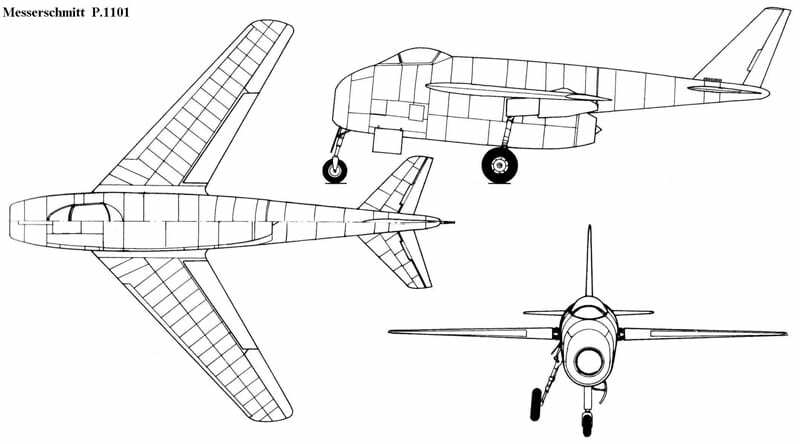 The P.1101 had variable-sweep wings (with a maximum span of 27 feet 0.5 inches) but the angle of sweep had to be adjusted by technicians on the ground. Having the wings swept forward improved performance when taking off or landing; having them swept back increased speed and performance at altitude. Robert J. Woods, Bell Aircraft Corporation’s chief design engineer and a key figure in the exploitation of German technology, became interested in the P.1101’s variable-sweep wing and tried to have the prototype completed in Germany under American supervision. With the French withholding documents and pieces of the prototype nabbed by GIs as souvenirs, the idea of flying the P.1101 at Oberammergau failed to materialize. The P.1101, plus a second set of wings, were shipped to Wright Field, Ohio. Air Force technical experts spent some time studying it, could find no further use for it, and transferred it to Woods’ company in Buffalo, N.Y., which was already making its mark in technology with rocket-powered research aircraft. After further, fruitless efforts to find a way to fly the original, Bell proposed a new aircraft based on the P.1101 but with the capability for the pilot to adjust wing sweep while in flight. Basking in the success of Capt. 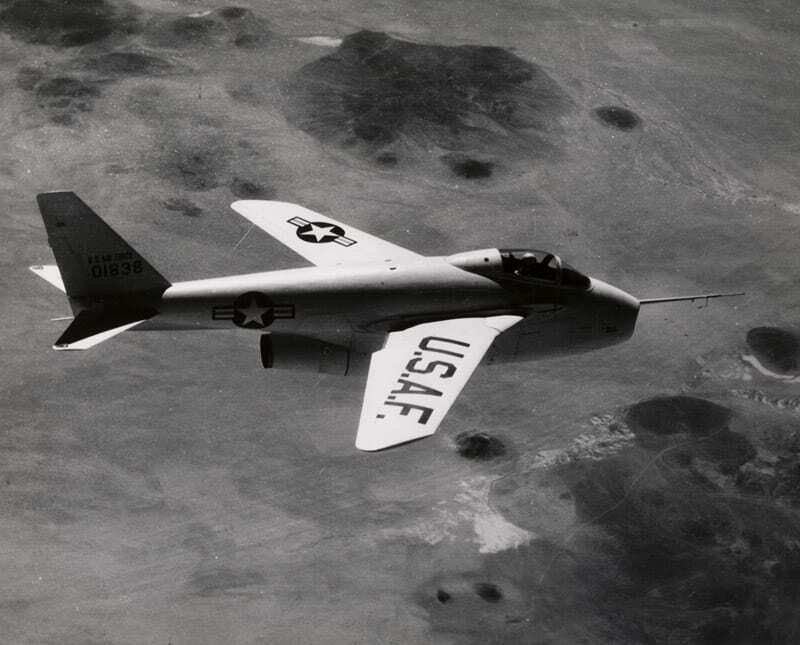 Charles E. Yeager’s first supersonic flight in the rocket-powered XS-1 on Oct. 14, 1947, and with the company’s X-1A and X-2 rocket planes about to make headlines, planemaker Larry Bell and right-hand man Bob Woods believed the P.1101 gave them the makings of the fighter of the future. Had they been right, a Bell version of the P.1101 might have been ready in time to fight the Soviet MiG-15 in Korea. But it was the F-86 Sabre, influenced by the Messerschmitt Me 262, which filled that role. The MiG itself was influenced by the Me 262 and another German design, Kurt Tank’s Ta 183. Air Force officials saw promise in a proposed P.1101 derivative, but believed it would lack the capacity to carry guns or ordnance. With strong backing from the National Advisory Committee for Aeronautics (NACA), the new Bell aircraft became a research plane, the X-5, powered by a 5,000-pound thrust Allison J35-A-17 turbojet engine. It was planned to replace the J35 with a Westinghouse J40 eventually, but the latter engine became a spectacular failure, so the powerplant change was never made. 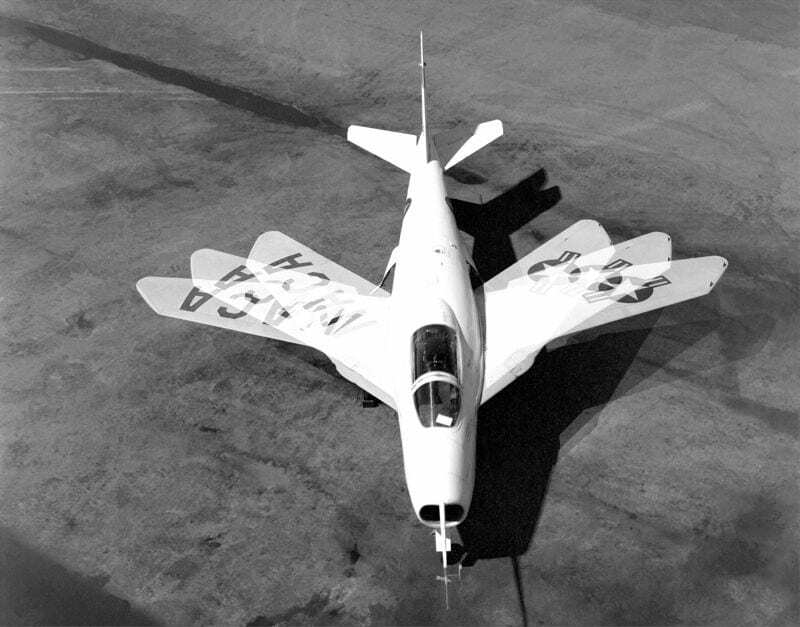 Bell built two X-5s, and flew both at Edwards Air Force Base, Calif., the first on June 20, 1951 with company test pilot Jean “Skip” Ziegler at the controls. (Ziegler lost his life in the explosion of an X-2 rocket plane while a B-50 Superfortress was carrying it on May 12, 1953.) The wingspan of the X-5 was 20 feet 9 inches at maximum sweep (55 degrees), and 33 feet 6 inches when nearly unswept (at 30 degrees). A “glove” designed by Woods moved fore and aft along the fuselage on rails with changes in wing angle in order to assure stability. The X-5 proved difficult to fly, even in the hands of test virtuosos like Ziegler, Yeager, Albert Boyd, Scott Crossfield, and Neil Armstrong. It was unstable under certain conditions and had bad stall characteristics. On Oct. 14, 1953, a spin recovery problem led to the loss of the second X-5 and caused the death of Maj. Raymond Popson. The first ship continued research flying with NACA, but an attempt to revive a fighter version went nowhere. In Sweden, the SAAB design team under Lars Brising acquired P.1101 data and used it to explore the swept-wing configuration with an experimental version of the SAAB 91 Safir. This led to development of the SAAB 29 Tunnan (Barrel), designated J29 by the Royal Swedish Air Force and first flown on Sept. 1, 1948, with British test pilot Robert A. Moore doing the honors. While it had roots in the P.1101, it did not employ variable-sweep technology. 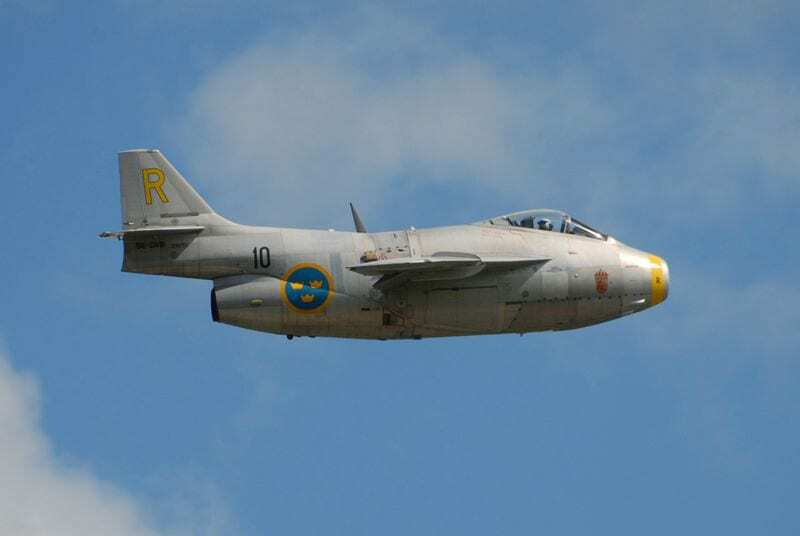 SAAB built 661 Tunnans between 1950 and 1956, and despite its portly appearance the Tunnan was very comparable to the F-86 and MiG-15. Many other jet warplanes from the 1950s onward mirrored the size and shape of the P.1101. The Messerschmitt airplane’s most significant feature, the swing wing, found its way to many subsequent aircraft, including the MiG-23 “Flogger,” F-111 Aardvark, F-14 Tomcat, and B-1B Lancer. About a dozen J29 Tunnans survive today in various museums. The sole surviving X-5 is displayed at the National Museum of the U.S. Air Force in Dayton, Ohio. Messerschmitt (1898-1978) was briefly imprisoned as a “fellow traveler” of the Nazi regime, was released in 1948, and continued his long and fruitful career as an aviation engineer and entrepreneur.